We enjoyed a beautiful Sunday with family and friends, hearing triumphant music in church from Robert and Daniel followed by an inspiring message, soaking up the warm sun, watching little girls running happy around the yard in their new dresses (and Sauntina was VERY ecstatic to not wear socks or a jacket! 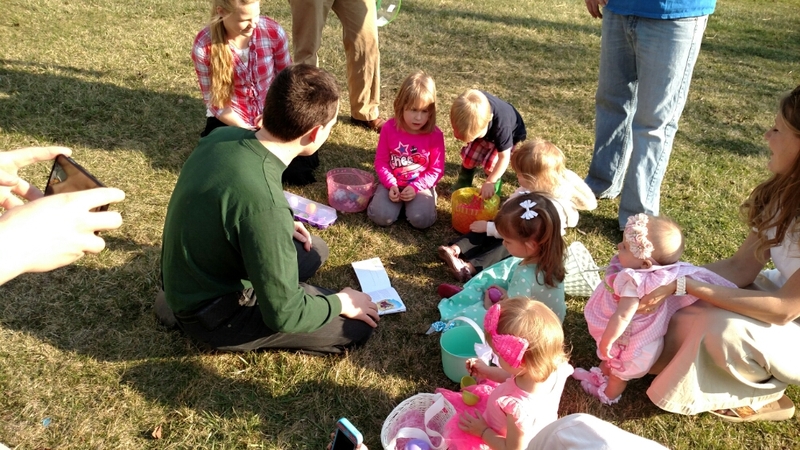 ), and hearing Robert tell the children about the first Easter using colored eggs they had found containing different pieces of the story (i.e., a donkey, whip, rock, cloth, and empty egg). Because He lives, we can face tomorrow! This entry was posted by Kendalyn on Tuesday, April 7th, 2015 at 1:50 pm and is filed under Family News. You can follow any comments to this entry through the RSS 2.0 feed. You can leave a comment, or trackback from your own site. What a lovely family God has granted ya’ll! HERMANOS EN CRISTO: EN 1 DE CORINTIOS CAPITULO 5, VERSICULO 7, DICE QUE CRISTO ES NUESTRA PASCUA, NO HABLA DE UNA FECHA ESPECIFICA DURANTE EL AÑO, NO HABLA DE QUE HAY QUE FESTEJAR, NOS HABLA DE QUE DURANTE TODO EL AÑO NUESTRO SALVADOR DEBE VIVIR EN NUESTROS CORAZONES, EN NUESTRA MANERA DE CONDUCIRNOS, EN NUESTRO DIARIO CAMINAR CRISTIANO. CRISTO MISMO ADVIRTIO EN SAN MARCOS CAPITULO 7, VERSICULOS: 6, 7,8 Y 9. HERMANOS CRISTO ESTA CERCA, SEÑALES HAY, SAQUEMOS TODO LO QUE NO LE AGRADA AL SEÑOR DE ADENTRO DE NOSOTROS, Y VIVAN UNA VIDA PURA, SIN MANCHA. BENDICIONES DESDE BUENOS AIRES,ARGENTINA. It is such a blessing to see your sweet, growing family! Our hearts are encouraged to know that there are still young families seeking to follow the strait and narrow path! Keep on, because He is worthy! It is such a blessing to share in your pictures. Your family is so honoring to the Lord! Thank you for posting!